Wish you could post a fresh snapshot from your iPhone onto your Facebook wall without having to open the Facebook app? Well, there is a way, even though there’s no “Send to Facebook” button in the iPhone’s Camera application (or at least, not yet). Here’s the trick: using a personalized email address for uploading photos to Facebook. 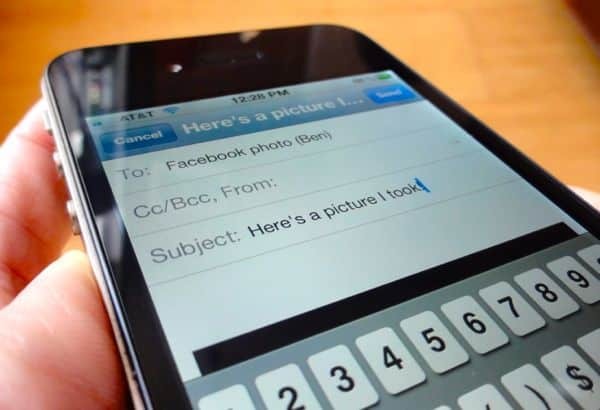 Just attach the photo you’d like to post to the email, add your custom Facebook email address, and use the subject line for adding a message to go with the photo (like “Cool photo!”). Update [7/18/12]: Facebook has (surprise, surprise!) changed the way to get your “post-by-e-mail” address. Click here for more details and step-by-step instructions. Log into your Facebook account, then visit the Facebook Mobile page. Look for the section labeled “Upload via Email”; there, you should find your custom email address for uploading snapshots to your Facebook wall. If the address looks like gibberish (like “[email protected]), don’t worry—that’s how it’s supposed to look. Whoosh! Your photo will be automatically posted to your Facebook wall, using the default Facebook privacy settings (which you can always change by clicking the arrow in the top-right corner of any Facebook page, then select Privacy Settings). A word of caution: Don’t share your personalized Facebook Mobile email address with anyone—that is, unless you’re fine with strangers posting random pictures to your Facebook wall. If you’re afraid your Facebook Mobile address is out in the open, you can always reset it from the Facebook Mobile site. Just click “Find out more” under “Upload via Email,” then click the “refresh your upload email” link.